In addition to the processor for better performance in the smartphone, the display is also considered to be a key factor. Let us know that the screen quality and pixel resolutions are proportional to each other. But if the technique used in pixels, then it becomes a bit difficult to understand. If we talk about smartphones, then two techniques are used. The first is the AMOLED and the second LCD. But do you know the difference between these two screens. If not, then today we are going to tell you the difference between the two screens. By the name AMOLED you may have understood that it is a variant of the OLED display technology used in the television. First of all know the meaning of LED. It means Light Emitting Diode. After this, O means “Organic” and “AM” means Active Matrix which is capable of giving better quality to any pixels. AMOLED has all the features of OLED display such as color reproduction, better battery life, high brightness and sharpness. Apart from this, the AMOLED display also includes TFT that is thin film transistor which makes the whole process of sending pixels in the right direction easy and smooth. At the same time, with the help of an active matrix, TFT gets a control to operate different pixels. Speaking of LCD, this smartphone has the most views. This means Liquid Crystal Display is. There is a dedicated white backlight in the LCD display. It comes with Blue Tint. Because white light is a mix of all colors. Apart from this, both the active and passive metrics are given in the LCD display. Which matrix in which phone will be given depends on its need and price. Now it is very important to know which is better than these two screens. However, if seen in AMOLED display, it is better for future smartphones but both screens have some advantages and some disadvantages. In this post we are going to give you information about what are the main differences between these two screens. The first main difference in both techniques is the price. If you are looking for a budget smartphone with AMOLED display, it can prove to be very difficult for you. That’s because LCD displays can be made at a very affordable price. While making AMOLED or OLED display cost more. The quality of any display is measured with its sharpness and color. At the same time, only a technique can not be measured on the basis of technology. This is because if two manufacturers make a display from the same technology then they are difficult to distinguish them and they can give different results. If we only look at the colors, AMOLED’s high-contrast colors give better quality to the user. That’s because every single pixel in the AMOLED display produces its light. While the LCD pixel light source has backlight. AMOLED has more colors, while the LCD has a white color. Therefore, colors of AMOLED display are much better because yellow and red tint is given in its whites. The LCD screen winner in this segment. Because AMOLED’s low light brightness level is not good. While the LCD performs better in this segment. In such a case, if you use a smartphone in the sun then the LCD display provides a much better result. In the case of battery consumption, the phone’s display is also considered an important factor. If the phone is locked in AMOLED phone then your battery consumption will be lower. Because the black background in the phone remains. But LCD display requires a dedicated backlight, so it consumes more battery. If a company with an LCD screen gives the Always On display, then the battery will end soon. Because of this, companies always offer Always On Display with AMOLED Screen. 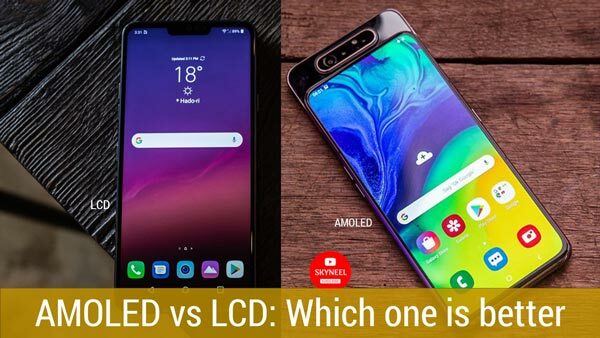 AMOLED vs LCD: What’s better for you? If the losses and advantages of the two displays are seen, the AMOLED panel can exit the LCD panel anytime. Because color in AMOLED is better and battery consumption is low. But if the brightness level is spoken, then it is being improved gradually. However, in many cases it is also circumvented. In this article, we told you about AMOLED vs LCD: What’s better for you?. If you liked this article, you can also like our Facebook page and also subscribe to our YouTube channel. If you have any problems related to this article, you can tell us by commenting.